Strapping in a car seat for kids seems like a simple task. But Safe Kids Worldwide estimates that 3 out of 4 car seats are not used correctly. That puts millions of kids in danger while they're on the road. Here are 10 questions to ask yourself to make sure your kids are riding safely. 1. AM I USING THE RIGHT SEAT? Rear-facing seats with harnesses. These are for all kids to use as long as possible, from birth until they reach the height and weight limit allowed by the seat's manufacturer. Most rear-facing seats will last your child at least two years. Forward-facing seats with harnesses. Use these after kids outgrow their rear-facing seats. Keep using them until kids hit the upper height or weight limit set by the seat's manufacturer. It's best for kids to ride in a seat with a harness as long as possible, at least to 4 years old. Booster seats. Older kids use these until adult seat belts fit them properly. This typically occurs when children are 4 feet, 9 inches, tall and 8 to 12 years old. Learn more about using the right car seat. 2. CAN I USE THE LATCH SYSTEM? Nearly all passenger vehicles and car safety seats made since Sept. 1, 2002, have a system called LATCH. This stands for Lower Anchors and Tethers for Children. Vehicles with the LATCH system have lower anchors built into the back seat and a tether anchor behind the seat. Car seats have straps that connect to the anchors. If the LATCH system is used, seat belts aren't needed to secure the car seat. 3. IS THE TOP TETHER FASTENED? The top tether is a strap that connects the top of a forward-facing car seat to an anchor spot in the vehicle. Tethers keep the top of the car seat from lurching too far forward in a crash or sudden stop. This helps protect the child's head and neck. New, forward-facing child car seats have a top tether. All new cars, minivans and light trucks have been required to have tether anchors since September 2002. See your vehicle owner's manual to find where your tether anchors are. 4. IF I DON'T HAVE THE LATCH SYSTEM, HOW ARE SEAT BELTS USED PROPERLY? When seat belts are used to install a car seat, they must be routed through the correct path on the car seat and locked. (If you're unsure how to lock your seat belts, check your owner's manual once again.) The belt path may differ from model to model. Check the seat's instruction manual to make sure you're doing it correctly. 5. IS THE CAR SEAT TIGHT? If you can move the seat more than 1 inch from side to side or 1 inch from front to back, it's not tight enough. When installing, you may have to press down firmly on the car seat so that you can cinch the belts or the LATCH anchors tight enough. 6. IS THE SEAT ANGLED PROPERLY? This is important for babies who ride in rear-facing seats. The correct angle helps keep their heads from flopping forward. This protects the child's neck and head. Many car seats have angle indicators or adjusters that help you get the right angle. If the car seat instructions allow it, you can properly angle the car seat by putting additional padding under the car seat base, where the back and bottom of the vehicle seat meet. 7. IS MY CHILD BUCKLED IN PROPERLY? When buckling your child into the seat, make sure over-the-head harness straps are snug—adjust them as your child grows. Place the chest clip at armpit level to keep the harness straps on the shoulder. 8. AM I USING A BOOSTER SEAT CORRECTLY? Booster seats lift kids up so that seat belts, designed for adults, fit kids' smaller bodies in the right spot. The shoulder belt should lie across the middle of your child's shoulder and chest, not the neck or face. The lap belt should be low and snug across the upper thighs, not the stomach. The shoulder strap should not be tucked under an arm or behind the child's back. Booster seats often come with a plastic guide or clip that holds the lap and shoulder belt together and helps position them properly. Your owner's manual will have directions on how to use them. 9. DID I REGISTER THE CAR SEAT? It's important for the manufacturer of your car seat to know how to contact you in case the seat is recalled. To register, fill out the form that comes with the car seat and mail it in. Or go to safercar.gov/parents. 10. SHOULD I GET HELP? Not sure if your car seat is installed correctly? Have it checked. 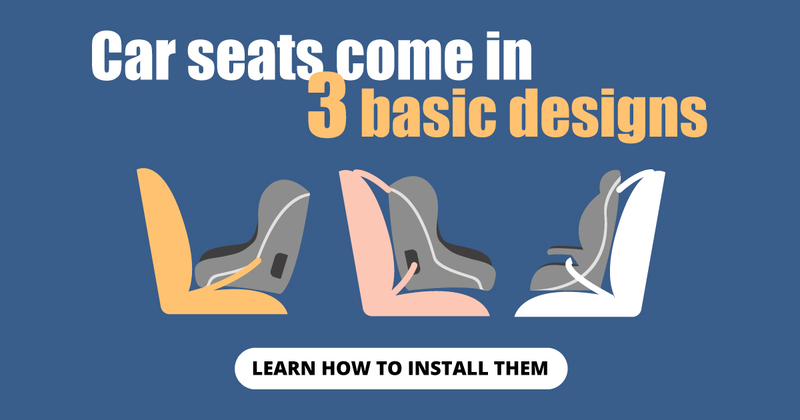 Even if you think your seat is installed right, having it checked is a good idea. A certified expert might find a problem that can be fixed—before an accident happens.